Home / Socks Socks Socks! We are so proud of all our recent Grow a Pair sock knitters that we are bursting with pride and inspiration to cast on all the socks! Each student walked away with at least one mini knitted sock, mastering all the essential techniques for your first pair of socks. Stretchy cast on’s, magic loop, heel flaps, turns, gusset shaping and kitchener stitch! Phew, all in one day. Well done ladies and gents. 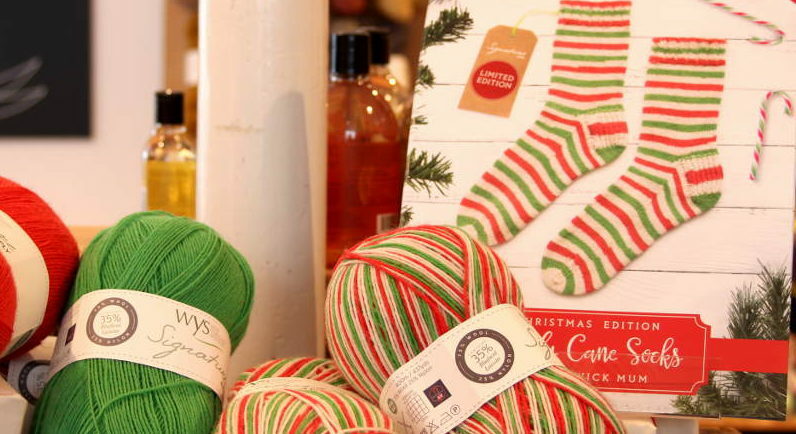 We also find ourselves with an abundance of beautiful sock yarn in the shop at the moment, perfect time for the weather to finally turn cold, we are dusting off our boots and hand knit socks and remembering how much we love them. Is finally time for accessories and all the knitwear! There is sock yarn for every taste, style and price range! We have been so looking forward to weather snap we are having a dedicated knit along for our Ravelry group. After the success of the Knit Night Timely KAL, we wanted to host another! So we will be knitting accessories, for yourself or for gifts. Me and Suzanne are thinking of knitting socks for our husbands, we are discussing possibilities of muted main colour with toe and heel pops. We will be using Emily’s Favourite Socks pattern for sure. Kate’s partner’s feet are far too big (size 15 yikes!) so she’s pondering over mittens but is also tempted by a pair of socks for herself in the new Signature 4 ply Candy Cane colourway (see below). Check out the discussion of Ravelry to see what everyone else is planning! We have beautiful autumnal shades in Crazy Zauberball sock yarn. This yarn is awesome, as well as the gradient colours, the plies of the yarn are also different colours creating subtle stripe changes. It comes in a range of colours from powdery pastels to rich, dark, saturated hues. We have a large range of beautiful speckled and vivid hand dyed Sock yarn from Hedgehog Fibres… You can definitely pair more muted with pops from their colour palette. We have just received our latest Skein Queen package, including four new colours in Debbie’s sock range Crush. They are fab, neon and fruity themed. We also received some festive themed yarn, so close your ears if your not ready for the Christmas word yet. But just look at this self striping candy cane yarn!! Each ball comes with a free pattern. West Yorkshire Spinners Signiture 4ply is our stead fast good sock yarn, and has a large range of solid colours, self striping and self pattering!